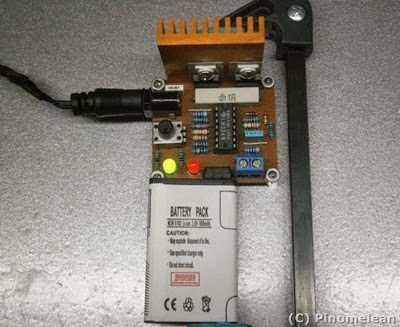 Pinomelean shows you how to build good Li-ion Battery Charger. He helps you understanding the theory of Li-ion Battery and design its charger circuit using Transistor TIP122 and Op-amp LM324. Lithium based batteries are a versatile way of storing energy; they have one of the highest energy density and specific energy(360 to 900 kJ/kg) among rechargeable batteries. They're really useful in electronics due to their relatively high cell voltage; high energy density; their shape, size and capacity variety, and their charge/discharge efficiency. The downside is that, unlike capacitors or other kinds of batteries, they cannot be charged by a regular power supply. They need to be charged up to a specific voltage and with limited current, otherwise they turn into potential incendiary bombs. It's no joke, storing such a high amount of energy in a small and normally tight packaged device can be really dangerous. Download this guide to learn and understanding everything you need to know about the Raspberry Pi computer, system specs, the software it runs and the amazing project based on this little PC. PEI is the leading magazine for the global electric power generation and transmission industry. PEI provides articles on new technologies and installations and analysis. EDN magazine provides how-to solutions for design engineers in the electronics industry. Engineers turn to EDN because they know they will always find valuable design techniques that they can use to do their jobs faster.